There's something a bit unusual about a game which calls you a wiener, has enemies such as a crazy Santa Claus and a person who tries to kiss you, and features a main character whose name sounds like something you'd get if you didn't bathe for a couple of days. For those and many more reasons, Toejam and Earl is certainly a very peculiar game. Hidden among all that strangeness, however, is a very entertaining game. Toejam and Earl features two characters of those particular names, who were on a rocket journey when an accident takes place, causing their rocket to crash and split into a bunch of different pieces. So, it is up to you to take control of them to explore the planet on which they have landed, and to gather all the pieces of the rocket so that they can leave again. Of course, one can assume that these creatures are very proficient in rocket construction, and that the pieces weren't damaged apart from being scattered in the collision, and so that once you have all the pieces, it's just a matter of tossing them back together and blasting off again. Certainly, how hard can putting a rocket together out of broken pieces be? That's just a small issue that doesn't need to be worried about, however. All you need to worry about is finding all of those pieces which have been scattered. Just to make things difficult, not only did the rocket split apart, but the pieces have been scattered in the furthest reaches of this planet, requiring one to explore numerous "levels" of the world. Some levels will have a rocket piece, and some will only have a bunch of obstacles. Once one has explored the level and found the exit (in the form of an elevator up to the next level), one moves on to the next area and begins exploration there. Each level is full of enemies, useful items which can serve a variety of purposes, and holes which will drop one down to a previous level, and will require a good deal of exploration in order to find everything that is needed. Exploring is not only useful for finding these items, however, but also a goal in itself. There is a map of each area which is visible, and which is broken up into individual squares of land. As one explores and moves onto a new square of land, it will give points, which will result in the character gaining levels. So, as one would in an RPG with monsters and such, exploration is a means to increasing levels in this game. This gives an added reason to explore every nook and cranny of each level, as opposed to just finding a rocket piece and leaving immediately. While this all still may seem rather like a standard, run of the mill "collect-athon" sort of game, as touched on earlier, what sets this game apart is its sense of style and humor. The enemies alone would be a reason to explore the levels, just to see the crazy sort of things that are encountered. Santa, a person dressed as a carrot, Hula dancers, crazy people with shopping carriages, wild hamsters, the Boogeyman, and a whole host of other equally odd people will be encountered during the course of the journey. As well, the items which will be gathered during the course of exploration are quite interesting, and while some are certainly more useful than others, they're all fun to just discover what they do and to just play around with them. Rocket skates, spring shoes, a boombox, and many other things will come in quite handy during the adventure. While playing, it's quite easy to completely forget about the ultimate goal of collecting the rocket pieces, and just to enjoy discovering all of the crazy stuff the game has to offer. There are two things, however, which set the game apart. The first thing is the levels available to play. There is a standard group of "pre-set" levels which are the same every time one plays, and in which one can become familiar with what to expect, and learn where to go and find certain things as one would in most other games. Considering how crazy the game is, knowing what to expect isn't always much fun. Plus, if one already knows where to find everything, it defeats much of the purpose of exploration. Fortunately, the game has a remedy for that, in offering a set of randomly generated levels as well. These levels are pieced together in all sorts of interesting fashions, and provide a new challenge and area to explore every time one plays. That way, there's a constant supply of new places to explore, paths to discover, and ways to get attacked and make use of items. Often fully exploring each individual level can be as fun as a game itself, and so having a constantly changing supply of these levels to explore is really a great option. The other thing which really sets this game apart is the two-player mode. Many games forego a two-player mode altogether, and of the ones that do have such a mode, often it's with the players alternating in a fashion that isn't too much different from a one-player mode with just passing the controller back and forth. 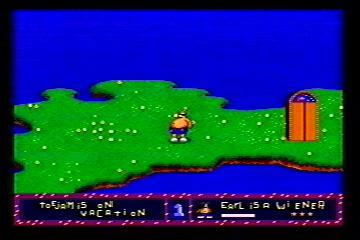 In this game, there is a two-player mode, with one player having control of Toejam and the other taking control of Earl. Each character has their own particular style, both in terms of how they control and feel and also their humor and responses. The two-player mode, however, as opposed to being separate and alternating, is simultaneous, with both players actively exploring the planet at the same time. How this happens, is that when both players are near each other, they both appear on the same big screen and move around in there. Once the characters get further apart, however, the screen splits in half, showing each player on their own half of the screen. This allows the players to explore independently, either on different parts of the same level or on different levels altogether, in search of items, or clearing pieces of the map. In order to progress up to the next level both players need to be in the elevator at the same time, so it does make sure that you stay somewhat together, but, players are free to explore on their own, sectioning off levels or however they choose. This mode is extremely enjoyable, and if one has a friend to play the game with, it can be fun to just wander around and explore and discuss all the crazy stuff in the game with another person. This is what Toejam and Earl is really about: Having fun and doing strange things. Sure, there's still that end goal of getting all those rocket pieces. Actually finishing the game, however, isn't nearly as fun as the process of playing through it. Whether in multiplayer with a friend, where it's quite possibly the most enjoyable two-player game available, or just alone exploring everything it has to offer, there's plenty of fun to be had. One can explore through the fixed set of levels, or have a never-ending supply of enjoyment with the randomly-created levels. Toejam and Earl certainly has plenty of fun to offer, and that is what really makes this game so memorable, and great to keep coming back to time and again.